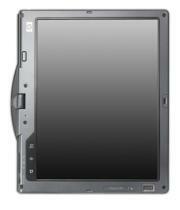 Last but not least, HP Compaq announced the HP Compaq tc4400 Tablet PC, a Tablet PC version of the nc4400. It’s a “convertible” or hybrid Tablet PC – it has both the digitizer/display that a normal slate Tablet PC would have, as well as having a physical keyboard. It shares the same internals (Intel Core Duo CPU, etc.) as the nc4400, but is slightly thicker (about a quarter of an inch) and almost a pound heavier, due to the fact that it has the convertible/swivel display. It’s available on May 22, 2006 as well, and it replaces the tc4200 Tablet PC. This entry was posted in Announcements, HP/Compaq, Tablets. Bookmark the permalink.